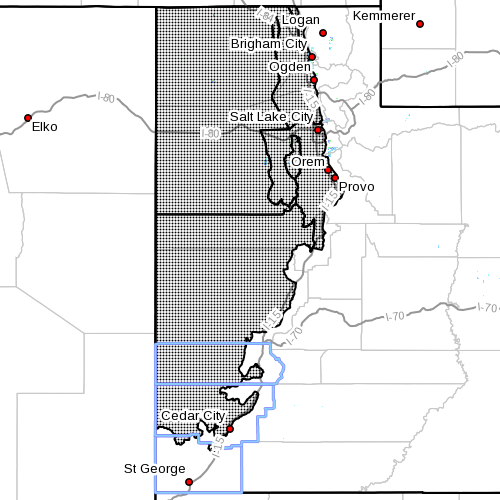 SOUTHERN UTAH – The National Weather Service has issued a wind advisory that is in effect until 6 p.m. Wednesday for the Wasatch Front, Tooele Valley, the Great Salt Lake Desert and Mountains, the west-central and southwest valleys. Winds south to southwest winds of 25-35 mph with gusts near 50 mph are expected. Strong southerly winds early Wednesday morning will gradually increase through late morning. These winds will remain strong through midafternoon, then gradually decrease late afternoon. Strong crosswinds will create hazardous travel conditions along west-to-east roadways. The greatest impact will be along Interstate 80 in Tooele County and Highways 50 and 6 in west-central Utah. A wind advisory means that sustained wind speeds of at least 31 mph or gusts of 45 mph are expected. Motorists in the advisory area should be prepared for sudden gusty crosswinds which can make driving difficult.